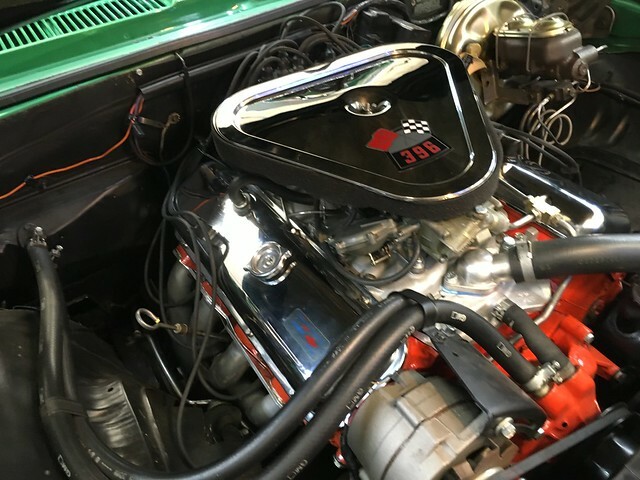 Tri-Power 427 fit under 69 SS hood? 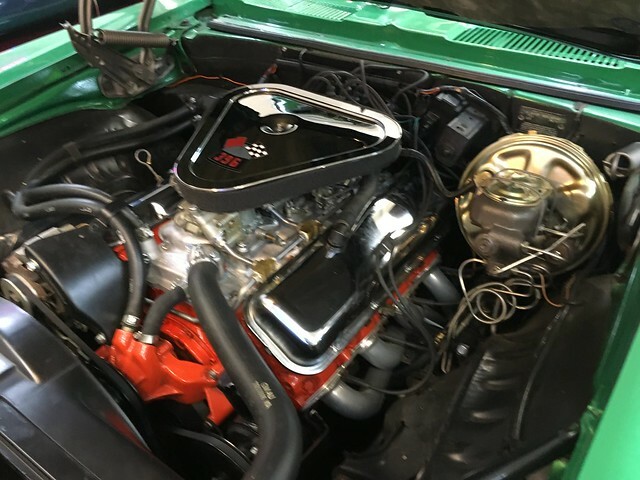 Re: Tri-Power 427 fit under 69 SS hood? Always been a fan of the tri-power cars, I think I remember seeing a 1967 Deepwater Blue Nickey with a tri power at the 1985 World Of Wheels Auto-rama in the Seattle Coliseum show in fall of 85's I need to look for a instamatic pic I took and scan it and post it. Thanks for the spotting tip on the water outlet, I always assumed all three years were the same, but it make sense cause of the alternator relocation issues with that outlet. 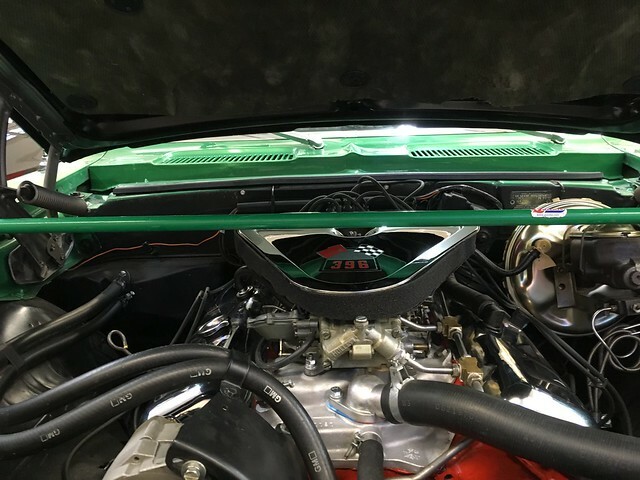 I know this is an old thread, but it seems that a tri-power set up might fit on a big block under a stock Camaro hood. 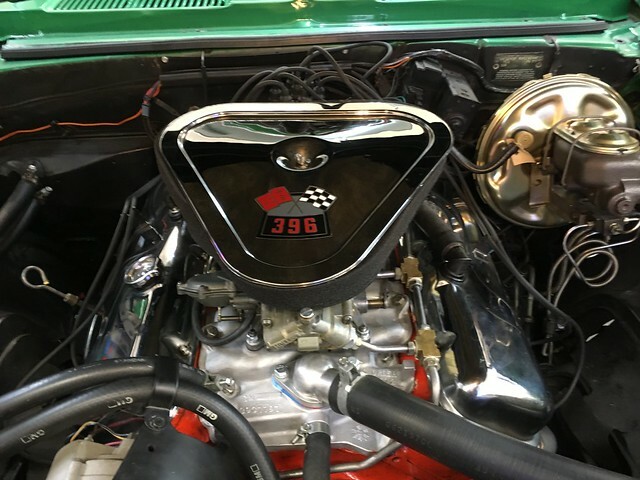 One way to find out is to measure the height of a stock Chevy bbc intake, 4-barrel carb and aircleaner and compare that to the measured height of a stock Corvette tripower intake, carbs, and air cleaner. Both measurements would need to be taken from a similar, unmovable point on both intakes, like the holes where the intake bolts pass through. Update on my set up. Got all the carbs sorted out and tested them on the test engine. A little tweaking and they worked really well. I have some pictures and a short video of it running on the 427 tester but I cannot get them to post. I have sent them to a fellow member if he wants to post. 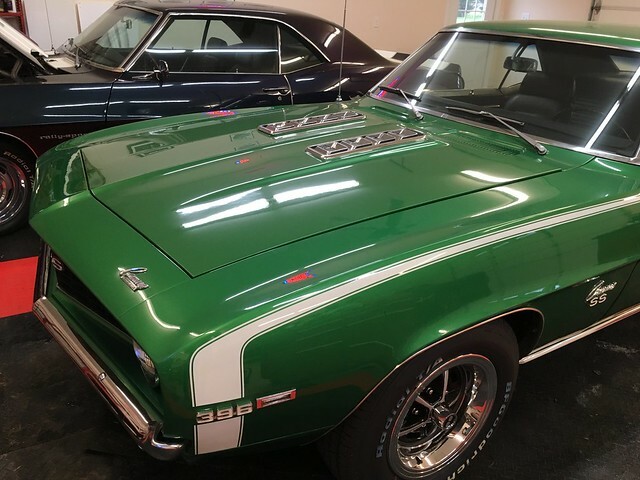 All information says it will fit but the true test is when I install it on my 69 SS. It is a 68 unit which is shorter than a 67 by over a inch. May get it on by next weekend. Also while checking Ebay for some choke parts I saw a plastic tote full of tripower parts with no bids. I tested the water with a number and well, I have that set up also. While tuning my tripowers on our test engine I verified some things. This was on GM aluminum intakes. The rectangle port intake will fit over oval port heads. Use the rectangle gaskets. No noticeable affect on street driving. The oval port intake will not cover the ports on rectangle port heads. Since the bolts of course do line up I checked for an adapter but found nothing. If someone knows of one I could use one. 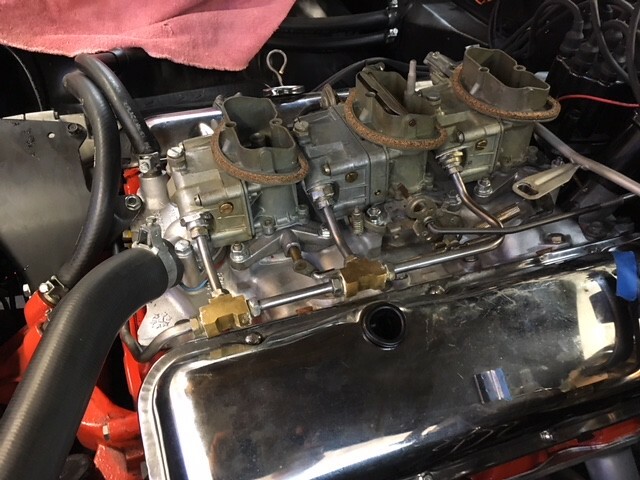 For tuning I may try using the oval port gasket that is not cut to the intake lines but straight across but if it works I would not use it to drive because the gasket material would be the only thing preventing vac leaks. A metal plate similar to the ones for blocking or reducing the heat riser ports would work and I may try to make some by making a cardboard template and having them cut with a plasma cutter. Something else I found during testing was that the secondary return linkage on the tripower must work perfectly. Any binding or misadjustment will cause the secondary carbs to slightly open which really messes up idle and part throttle running. I used the Mr. Gasket oval port gaskets on the rectangle port heads to test. They worked fine. 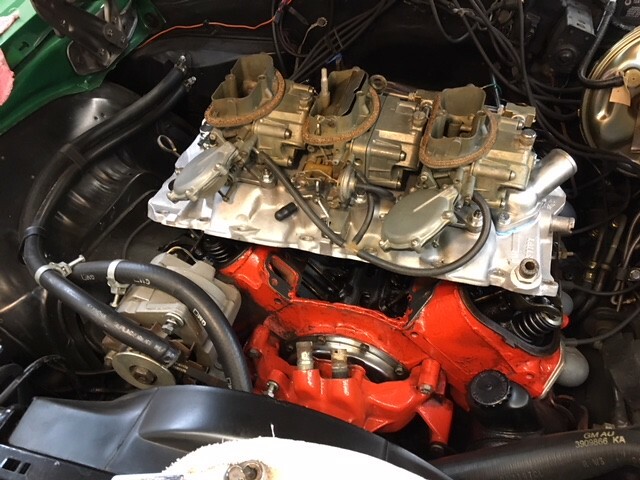 If I was going to drive it I would make a metal plate the same type as the heat riser block off plate supplied with gaskets to go over each pair of ports. This set took me a couple hours to debug and tune also but ran very good after that. The felpro or any gasket that matches the ports will not work. I finally got the tripower installed on my L78 last night. Since I had already run it on the test stand motor it went fine. 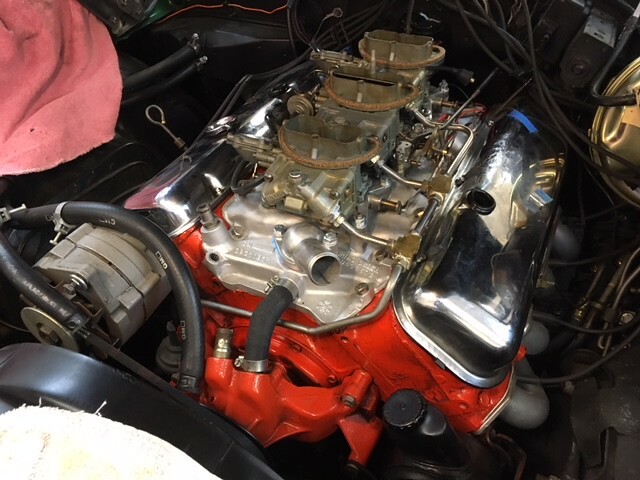 I did the old blue tape on the valve covers for distributer timing and bolted everything on and it fired up and ran great with only an idle adjustment. The L78 throttle linkage is a little to long and the coil bracket would only take one bolt but everything else fit fine. The PCV and air cleaner grommets switched sides and worked fine. 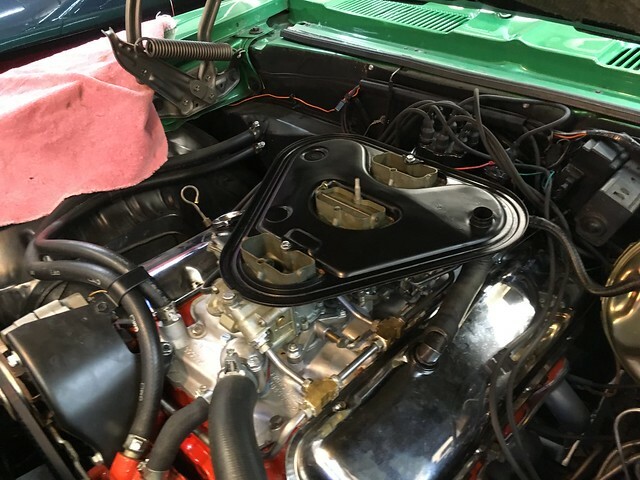 Hood clearance is fine and all hoses reconnected perfectly. It all looks factory. If it stops raining here road test is next. The L78 parts are shelf art for now. Congrats Kelley! That's not a set up you see every day on a 69 SS. I like it. Don't forget to take some pics for us pic addicts. Good luck with the weather and road test. Would love to see it!! Hawk if you send me your contact to Kelley@ryankingelectric.com I have some pics but I can,t get them to post. Since photobucket went out I have not gotten a resizer to work yet. I also did a short video of the startup but it takes a little while to download. Somewhat related. Attached is a pic of an L71 from a very original 67 Corvette. Here are a few of Kelley's pics. More to come later. What a nice set-up Kelley! Cool factor is off the charts. More pics from Kelley. What a nice clean install! *Looks* are Super; neat update.. This thread kind of started with hood clearance. It does fit, the green pole is to give you an idea of how much. This is a 68,69 style unit. The 67 is 1.5 inches taller, but since they bring a premium price if you had one a trade would be really easy. Since Noah is building an Ark hear is NC I have not yet road tested it yet but it runs really well in the shop. A friend is checking his parts for a shorter throttle rod. The L78 is a little long and I can,t get wide open throttle with it. It kind of surprised me that it fit with really no modifications.